There is no doubt that CAMRA members love their presentations to be turned into special occasions. In this branch area the presentation on the 24th March 2016 of the CAMRA National Club of the Year to the Albatross R.A.F.A. Club in Bexhill was the biggest occasion to date. 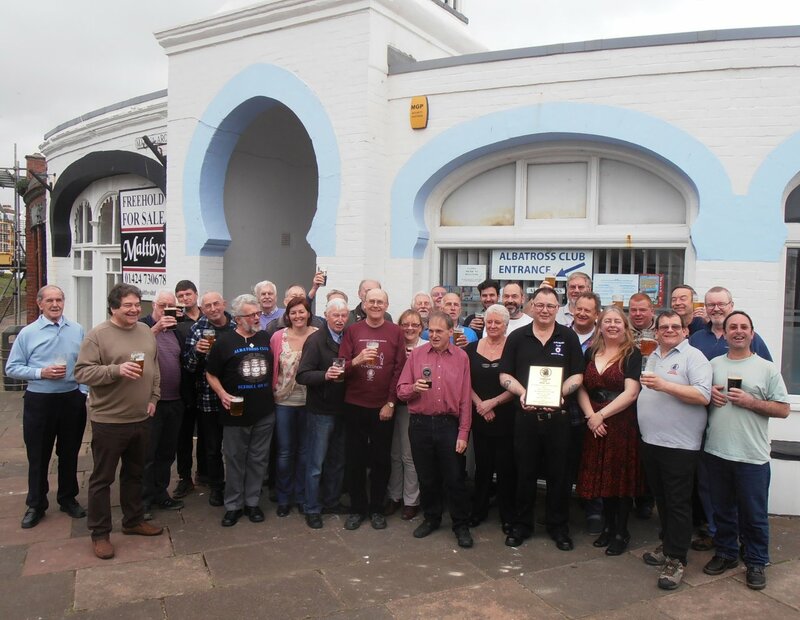 The need to balance media exposure and the travel of visiting CAMRA people from afar with getting a large turn out of local members meant that sadly many working members missed the 1:30 p.m. presentation, but were able to join the celebrations which continued for the rest of the day. 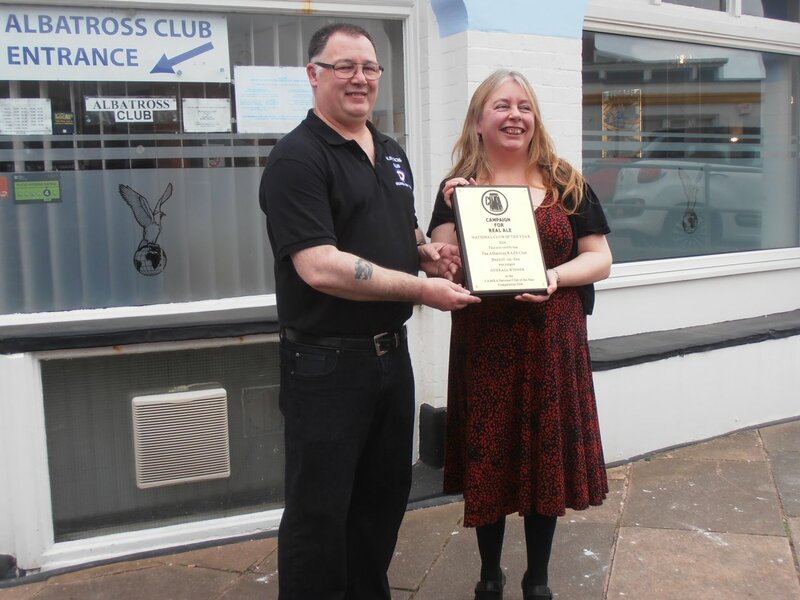 The Albatross Club has been in the Good Beer Guide since 2013 and has been the South East Sussex Branch’s Club of the Year every year since the Branch instituted the competition in 2011. It is not that other clubs are poor, on the contrary, but the Albatross has been so good. When Geoff Wentworth took over the club’s stewardship, he inherited a situation where the promotion of real ale was half hearted. It was on offer, but mostly the same couple of beers from a single local brewery which had become rather a habit and which sold just well enough to justify their presence. With the backing of the committee Geoff started the process of more imaginative beer selection, looking for a variety of styles and trying the beers from breweries near and far. As word got round, the membership of the club increased, CAMRA members became interested, sales increased, necessitating the installation of a third handpump. The club committee voted to give card carrying CAMRA members entry to the club, although many members of each organisation decided to support the other by becoming members of both. The frequent presence of supportive CAMRA members helped the further development of real ale and cider, as it does in many a pub. When Geoff decided it was time for him to move on, to realise his aim of running his own show, a bar in the Pantiles in Tunbridge Wells, Karen Pelham was appointed steward. It is often said that she just continued the good work already begun, indeed she has said that herself, but she deserves more credit than that. 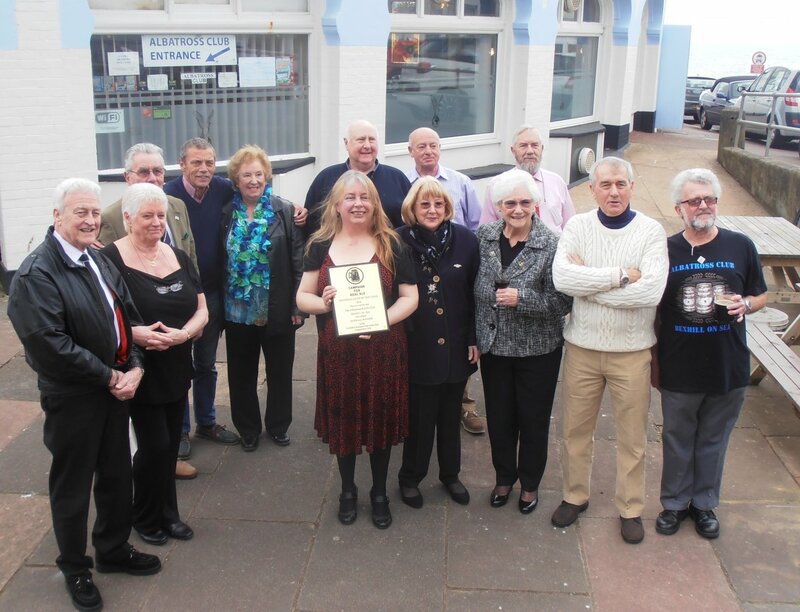 She has moved things further on, a fourth handpump was installed and under her stewardship the club has further developed into what you see now as the CAMRA National Club of the Year. Turning to the presentation itself, credit to Chris Johnson of the CAMRA HQ staff who set up the event and was successful in getting local TV and radio coverage for both the Club and CAMRA. 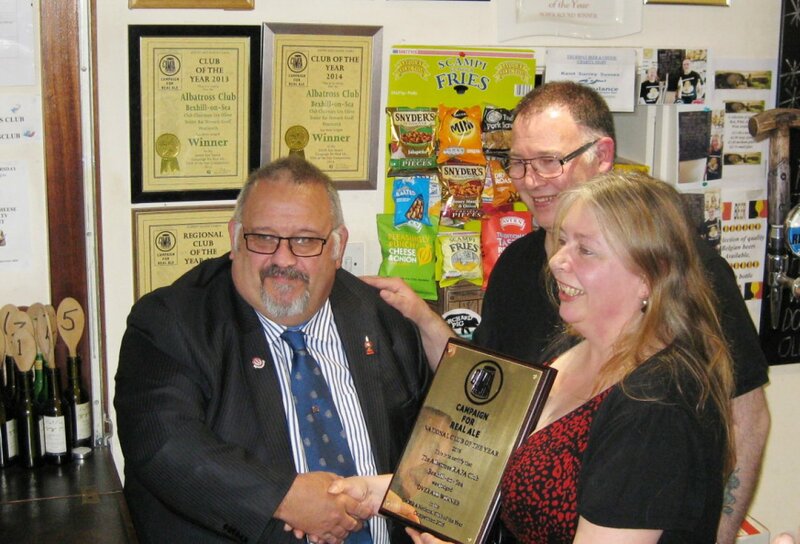 In awarding the plaque to Karen, the club steward, and her assistant, Peter Fell, national competition judge, Keith Spencer, said that by the time a club gets through the various local and regional stages of the competition, the beer quality is not the deciding factor; it must have been good to get a club into the national final. Once there it is the feel of the club itself which is all important and while the Albatross may look unassuming from outside, the warmth of the welcome and other impressive factors make it a worthy winner. and finally the two of them with their award.